The majority of the commitments to reduce emissions in Paris were motivated by multisolving, the search for climate solutions that produce immediate, local benefits. Climate strategists should take note. When French Foreign Minister Laurent Fabius announced the signing of the Paris Climate Agreement, the results were clear. As it stands, the Paris agreement is insufficient to meet climate goals, but it does create a process for countries to make progressively stronger commitments to climate action over time. While strong climate action might call forth visions of burdensome costs and high levels of sacrifice, some city, state and national leaders arrived in Paris confident that climate ambition can be a pathway to improving the lives of their constituents. Mirroring a logic that has long been articulated by environmental justice advocates, many Paris commitments referred explicitly to the intersections between climate and other issues such as health, equity, jobs, or resilience. 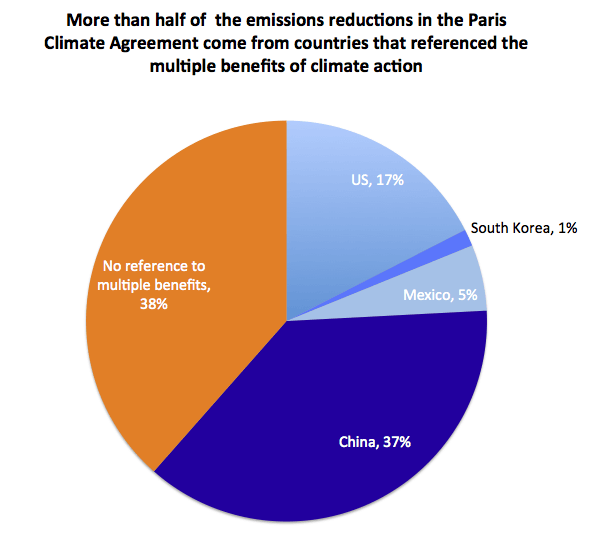 In fact, as the following three examples from Paris demonstrate, commitments that were motivated by pursuit of co-benefits contributed more to long-term climate protection than did commitments that were framed narrowly in terms of carbon and climate. Success #1: The Pledges themselves. Some larger countries also show signs of multisolving logic in their climate plans. For instance, on the official website for the Obama administration’s Clean Power Plan, which bolsters the US pledge, ten bullet points describe the benefits of the plan. All ten are co-benefits in jobs and health. Success #3: The emissions reductions committed by cities. Of course, there is a big difference between seeing the potential for co-benefits and implementing policy and investment strategies that capture them. There’s a new body of practice to be developed in reducing emissions while making progress in health, well-being, and social justice. There is also a new style of leadership needed, one that may be more typical of the environmental justice campaigner than the policy wonk. That is a leadership style that listens to all the people of place and draws perspective not just from climate and energy experts but also from community organizers, health care workers, youth, poor people, ecologists, city planners, economic development experts, and more. It won’t be easy, but, if the successes of Paris are any indication, it will be worth it.